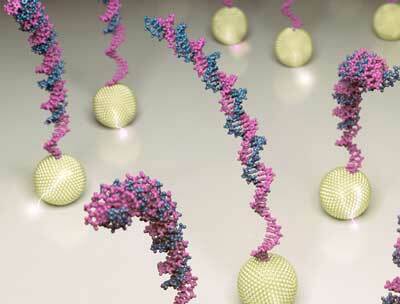 (Nanowerk News) Detecting a single DNA sequence demands high sensitivity. DNA amplification is used to generate thousands of DNA copies so that it can be easily detected and identified. To do so scientists often employ a technique called polymerase chain reaction (PCR). This method requires specific equipment, including a heat source because of the alternate cycles of high and low temperatures needed to perform it. Recombinase polymerase amplification (RPA) is a different procedure that has received much attention in recent years due to its versatility and isothermal performance. However, the technique offers better sensitivity between 37°C and 40°C, thus still needing a heat source. In this context, researchers from the ICN2 have published a paper in Analytical Chemistry ("In Situ Plant Virus Nucleic Acid Isothermal Amplification Detection on Gold Nanoparticle-Modified Electrodes") describing a new RPA amplification/detection approach at room temperature. Mohga Khater, last year PhD student, is the first author of this research carried out by the Nanobioelectronics and Biosensors Group, led by ICREA Prof. Arben Merkoçi, with the participation of Dr Alfredo de la Escosura-Muñiz (previous member of the Group). The research was fruit of a collaboration with Dr Laura Altet, from the company Vetgenomics. Plant Virus Nucleic Acid Isothermal Amplification Detection on Gold Nanoparticle-Modified Electrodes.